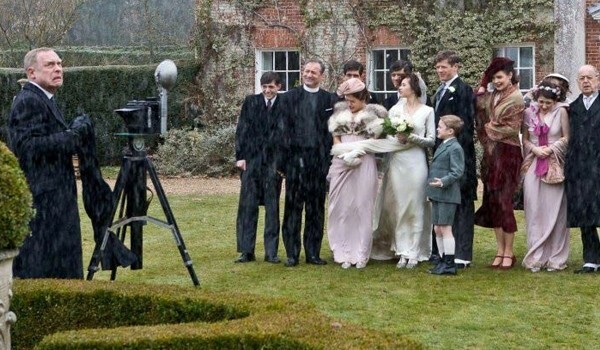 Do not be fooled by the title of the 2012 film, Cheerful Weather for the Wedding. This is NOT a fluffy historical rom-com. 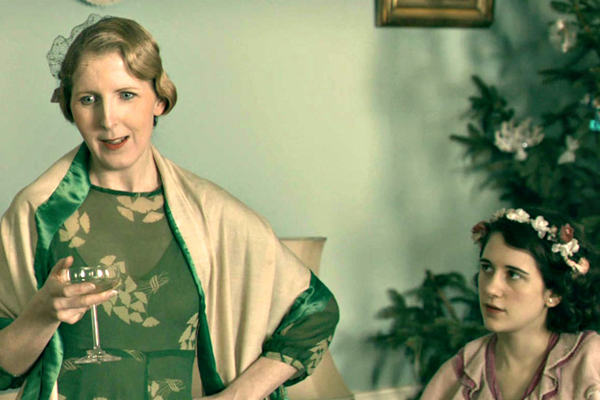 The movie does have some dry wit sprinkled throughout, and it reminded me a little of Gosford Park (2001) the way the story unfolded in a slice-of-life fashion. 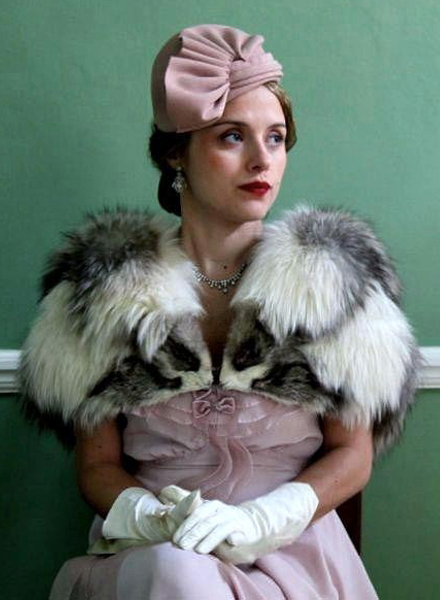 It’s based on a 1930s novella and feels like it. I can’t say too much about the plot because it’s complicated and there’s a will-they-won’t-they issue at the heart of the tale. So let’s talk about the actors and costumes! 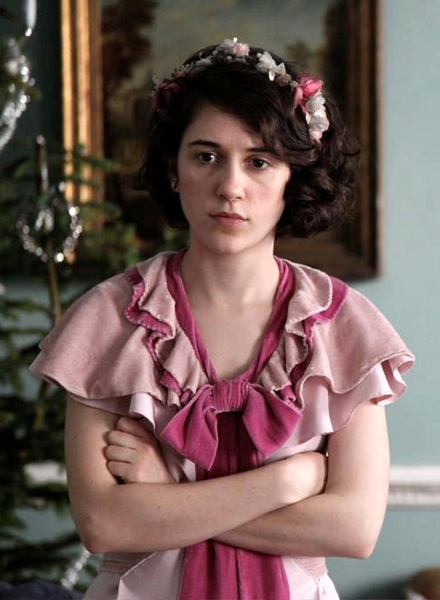 Who’s in Cheerful Weather for the Wedding? With that Altman-esque, everything-is-going-on-at-once way, this film really relies on excellent character actors to keep interest going. 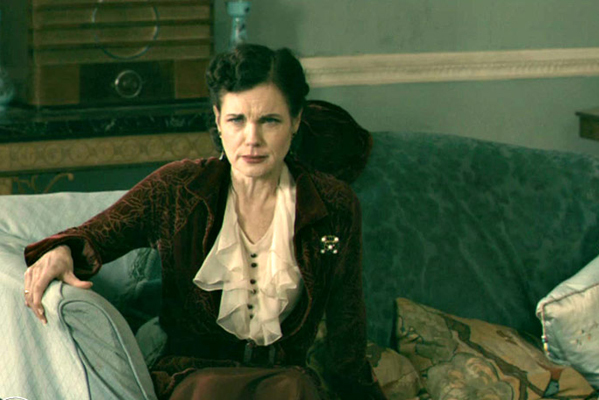 Elizabeth McGovern plays the widowed mother of the bride, kind of a sniping and hyper-controlling version of her Cora, Lady Grantham character on Downton Abbey. Felicity Jones (does she contractually get to have bangs in every role?) is Dolly, the bride at the center of the story. Hottie who has been in no other historical costume movies or TV shows (really boy, what is wrong with you? ), Luke Treadaway, plays the jilted love-interest Joseph who shows up on Dolly’s wedding day. Marriage – It’s better with booze. Several more familiar faces show up, my favorite of whom is Fenella Woolgar as an in-law with arch and perfect observations. She played Agatha Christie in a David Tennant-era episode of Doctor Who and is also in the World War II period miniseries Home Fires (2015). DO invite her to your wedding! Is It All Wedding Clothes? You’d think, wouldn’t you? Nope, we get flashbacks a plenty! Most of the story does focus on the actual wedding day, but we eventually find out why and how Dolly and Joseph hooked up. 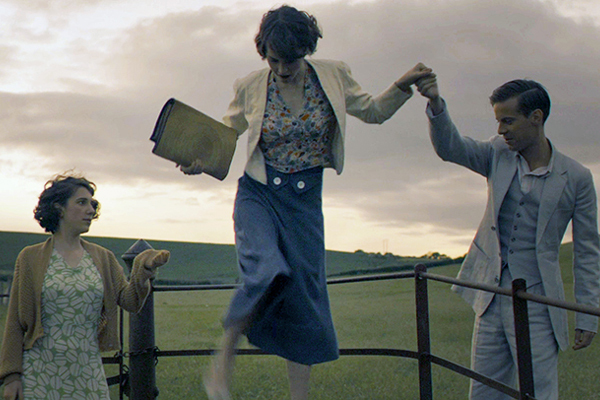 That gives lots of opportunity for cute 1930s sportswear, although the flashbacks feature the couple and just a few friends, so there isn’t a ton of diversity. The clothes are all beautifully made and styled, so much so that if you search for “Cheerful Weather for the Wedding,” you’ll turn up plenty of style blogs suggesting these clothes as still perfectly suitable for everyday wear today, in 2015. 1930s shorts … or 2010s? This dress is made for trouble. OK then, Dolly’s wedding gown. It has a bias-cut ’30 style, although for wedding gowns, front drapery necklines seemed to be more popular than the fitted V-neckline (this looks more like an evening gown style). The sister of the bride. 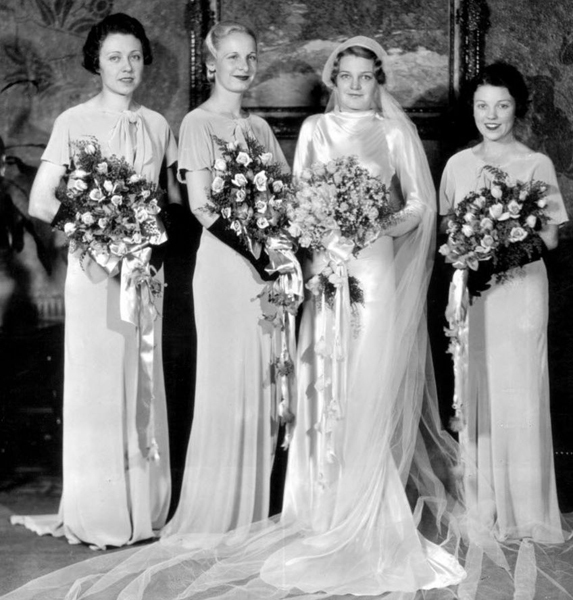 Compare with this period image from Cleveland.com of Mrs. Kenneth W. Lippert, aka Sara Lawton, and her bridesmaids in 1934, photographed by the Frank Moore Studio. 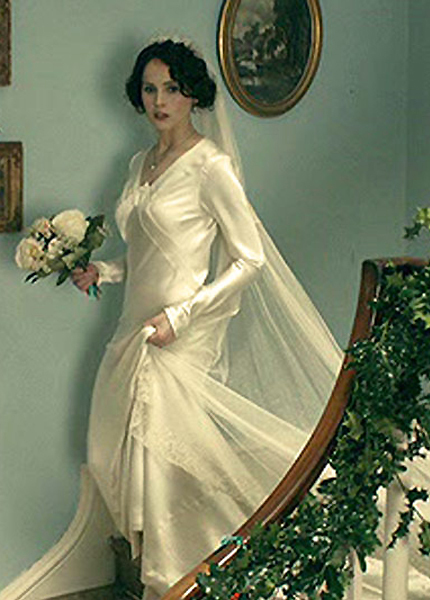 All of wedding gowns are very similar in shape to those in the film, other than the bride’s neckline. The bridesmaid gowns have somewhat similar capelet necklines, and the youngest bridesmaid even has a different look (like Dolly’s little sister). 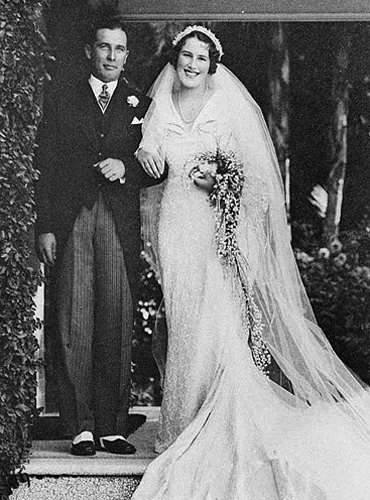 This Australian bride from the 1930s has a V-neckline but without the additional bias seaming of Dolly’s gown. 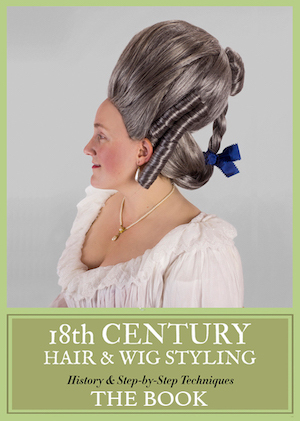 Her’s is in the realm of period possibility, just a little flashy for an afternoon wedding. We’re going to be so happy. 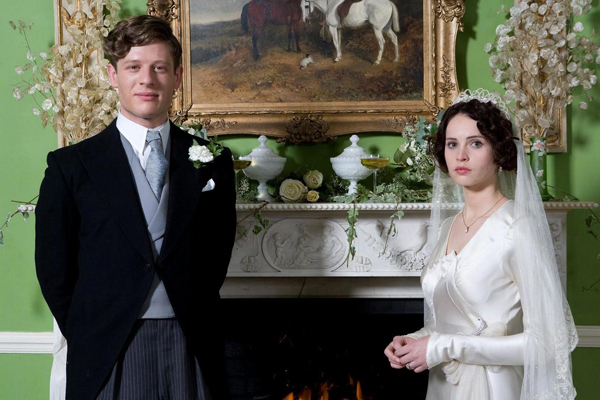 Have you seen Cheerful Weather for the Wedding? What did you think of the costumes (or the plot twists)?